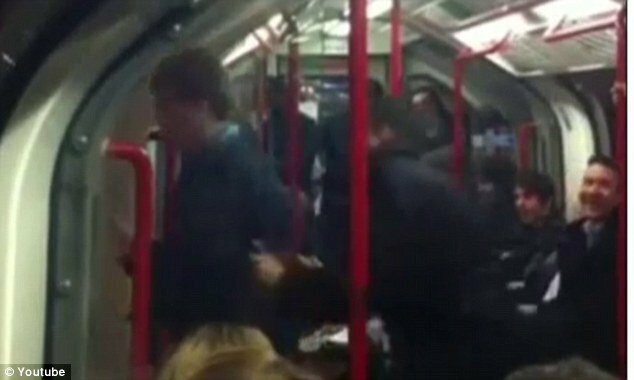 A London Tube train passenger was happily dancing and minding his own business when he was violently shoved in the back by a fellow passenger, through the doors and onto the platform as it prepares to pull away. A video of the attack on the dancing Tube man has been posted on YouTube and caused a storm among viewers. Many viewers have slammed the dancing man’s attacker, who flicks a V-sign at his victim after pushing him from the train, while others have commented on how hilarious the episode was. The video clip shows the dancing man happily ignoring fellow passengers as he boogies to the music playing through his headphones was shot by a fellow passenger seated further along the carriage. While his antics attract giggles, no-one attempts to make contact with the Central Line passenger until the train pulls into Leytonstone, East London. As the driver announces “mind the doors please, mind the doors” the man shoves the passenger in the back and out of the train. The dancing Tube man, who was heading in the direction of Epping, Essex, was not believed to have been injured in the incident. A spokesman for British Transport Police said they were aware of the incident but had not received any complaints about it. “We are aware of the YouTube video and our enquiries are ongoing. “British Transport Police has not received a complaint from anyone regarding this incident.